Hello, Underground members and Saga stalkers! Thank you for your time and for your vote! As always, it is greatly appreciated. Please note that this poll will be open for five days only! Aww, only 2 entries? Well, that does make it easier to choose. I've voted for Stitchedmoon's entry. It's just a heartwarming picture and nicely drawn. The banner is nice too. My only complaint would be that Albedo looks too feminine for my liking (and this is coming from a fan of bishounen characters, eep!). 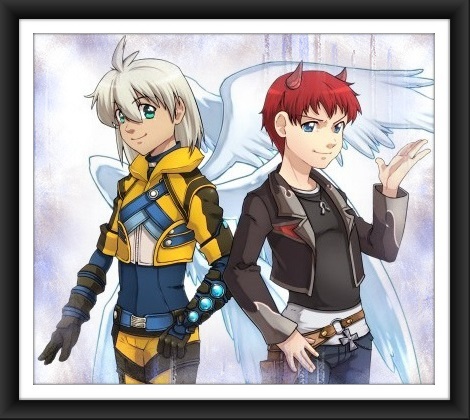 "aww, that's an adorable picture" > "oh, that's a cool banner"
I prefer stitched's entry. It's just an overall sweet and heartwarming picture. I voted for stitch too, it's so cute and I can't do anything about I love Ziggy-Juli-MOMO family topic. Banner from Leah is very good too, effects are simple and nice. I really liked stitched's,but since I can't access the site that leah posted,I'll try to fix it and manage to open it to at least consider both of the entries. After edit: managed to see both,both are great,but I'll stick with stitched's because I find it more heartwarming,and gives a more fitting idea of an embracing community such as ourselves ^^.